Church of the Big Sky: Well, that's disturbing. Okay, that just puts the "eep" in "creeps me out." I had a boss who looked like a Civil War era soldier. Wore this awful lip-covering mustache and had that crazy look in his eyes that always seems to get captured in those types of photos. Maybe that's one secret that should have stayed a secret. The diversity of human turn-on's boggles the mind. 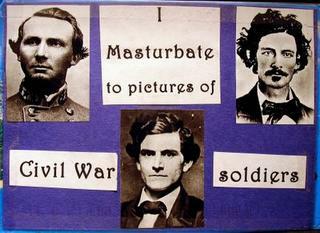 How exactly does one make that first connection between pictures of Civil War soldiers and a sexual response. Can we blame this on Margaret Mitchell? Frankly, my dear, I don't give a damn, it's just creepy. Okay and thought people with foot fetishes were odd, this is way beyond. Can you imagine this person back in school when they discussed the civil war or even worse showed documentaries EWWWWWWWW. The visual just gave me goosebumps. Feeling unclean now... can't wash off the shame need brillo pad. Ahhh much better now. Okay so I am strange but not as strange as that !! You know, there are so many terrible secrets people have, but after years of watching Law & Order, many of them seem relatively mainstream in their shock value. This one... man, it's just freaky.